The most common hornet species in the St. Louis area are The Yellow Jacket and The Bald Faced Hornet. Nest sites can vary from ground level shrubs to the highest branches of trees. Hornets nesting in the ground either choose areas bare of vegetation, or clear a space around its entrance. Nests may also be built on utility poles, sheds, or the overhangs of houses, but are nearly always constructed in sheltered locations. A mature nest is football shaped and can be as large as 14 inches in diameter and over 24 inches in length. The Yellow Jacket gets its name from its characteristic black and yellow color pattern. They are slow to sting unless the nest is approached, then they become quite aggressive. Yellow jackets stings are quite painful and they can sting a number of times. The Baldfaced Hornet is an atypically large variety of Yellow Jacket and is also named for its color scheme, primarily black with a mostly white face. While encounters with a single rogue hornet, or handful of them is fairly commonplace during the summer, stumbling upon a nest can result in severe consequences. 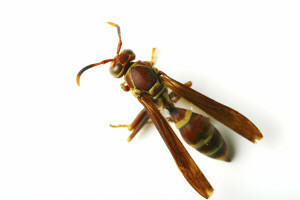 Hornets are extremely dangerous, as multiple stings can send a person to the hospital, and even a single sting can prove life threatening to sensitive individuals. Therefore, a professional is recommended when dealing with hornets. Hornets that have nested underground require direct treatment to nesting holes, so a topical chemical treatment is applied to the area. Occasionally, a follow up visit is necessary. We recommend using professional companies, especially under these circumstances. Not only will you avoid stinging injuries, you also eliminate the possibility of chemical cross contamination. An unsuccessful attempt to handle the situation yourself may leave residue of the chemical you applied. This could make it necessary to delay our treatment, in order to allow proper dilution before we can apply our own product.